Lady Penelope, the Thunderbirds agent with the whispery voice and vulgar accessories, is being flogged off by Bonhams the auctioneers. She’s expected to fetch a few bob, being an icon and all. Tragically, Working Title ballsed up the film version, having had years to get the thing right, but to some of us she will always be that giant-faced puppet in the pink Rolls Royce. Lady P’s head is apparently full of electronics that make her face move, so she has a head-start over her lookalike. Victoria Beckham is seen here emulating her role model. Why did Thunderbirds leave such an impression on children of all ages? It was a puppet show obsessed with mechanics, order, control, glamour and big wobbly heads on tiny high-stepping bodies. Ahh Thunderbirds! I am 7 again, sitting on the floor in front of the TV with my brother on Saturday morning, eating Cheerios and wishing the characters weren’t so jerky in their movements. 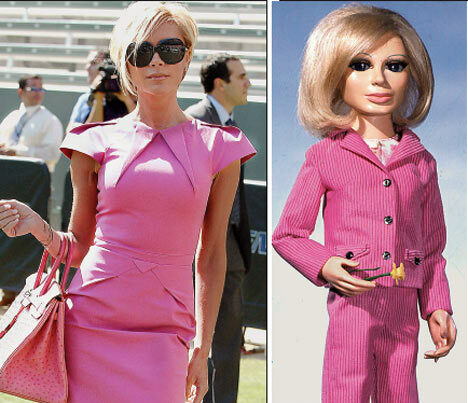 I can’t imagine what I would do with Lady Penelope but thanks for the reminder of whiling away my childhood.